Home / Militaria / Sale items! These items are a part of the sale with a lot of discounted items! 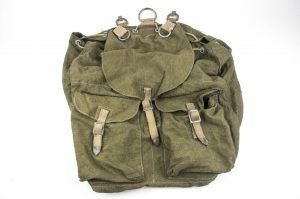 A rare full webbing 1942 dated tropical rucksack with aluminium hardware. Hard to find with the two frontal straps that are normally gone! 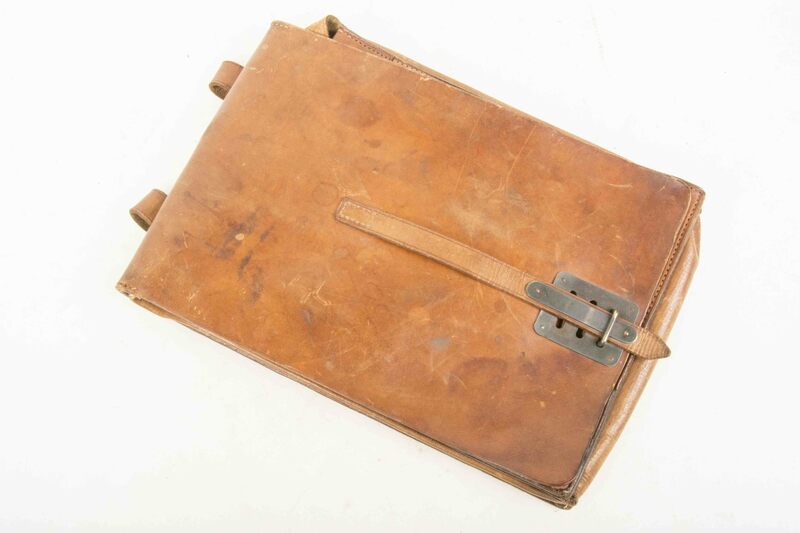 A very nice pre war Luftwaffe map case in light brown leather. 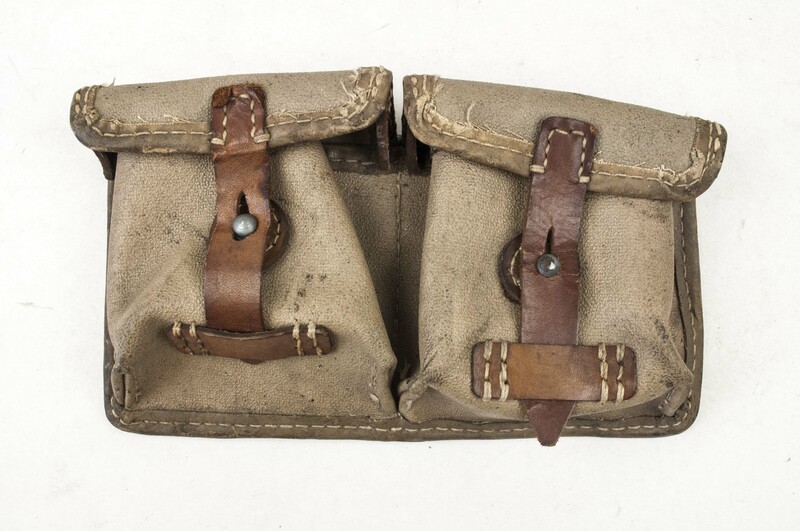 The mapcase is dated 1935 and is unit marked to Flak Regiment 5. Nice pre war mapcase! A rare Hautentgiftungsmittel box. Rare to encounter square variant with the red pressed paper box with the original label on the flask! A mint late war M44 Sturmgepäck. This rucksack is in very good condition and would be a nice addition to any equipment collection. The black leather is in good condition. A nice late war A-frame pouch in good used condition. A nice late war model manufactured from tan vinyl. This model is less common then the ROS 1944 models and is in unissued condition. 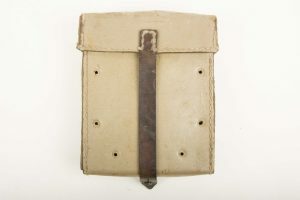 The pouch is not visibly maker marked but the design is that used by fuq or Curt Vogel, Cottbuss. A nice original pouch! A tan vinyl G43 magazine pouch. 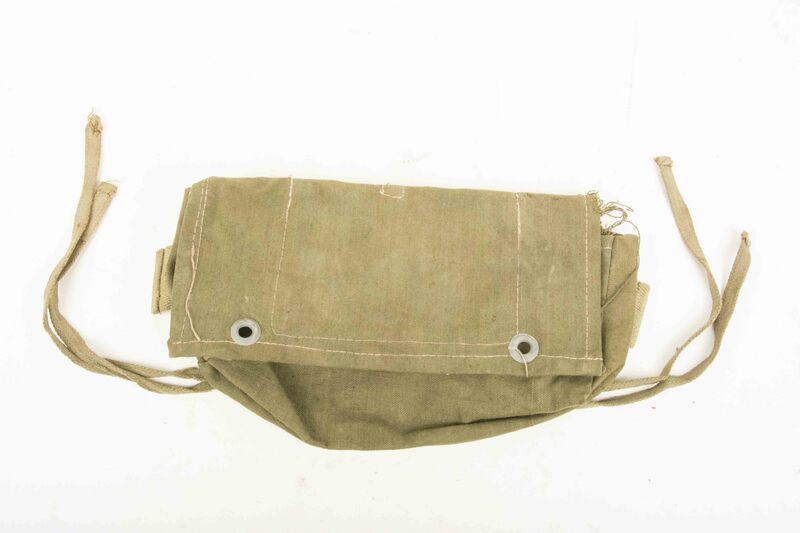 This pouch is marked ros 1944 indication production by E. G. Leuner, Bautzen. 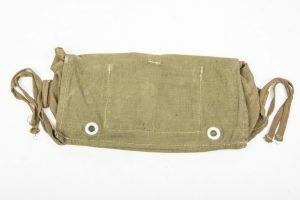 A nice G43 pouch in very good condition! 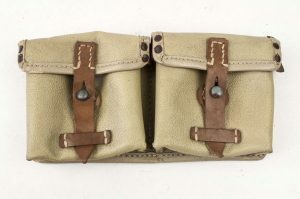 Textbook late war MG42 tool pouch in tan Presstoff marked gut 1943 of interesting mixed riveted and sewn construction. The pouch is in good used condition. 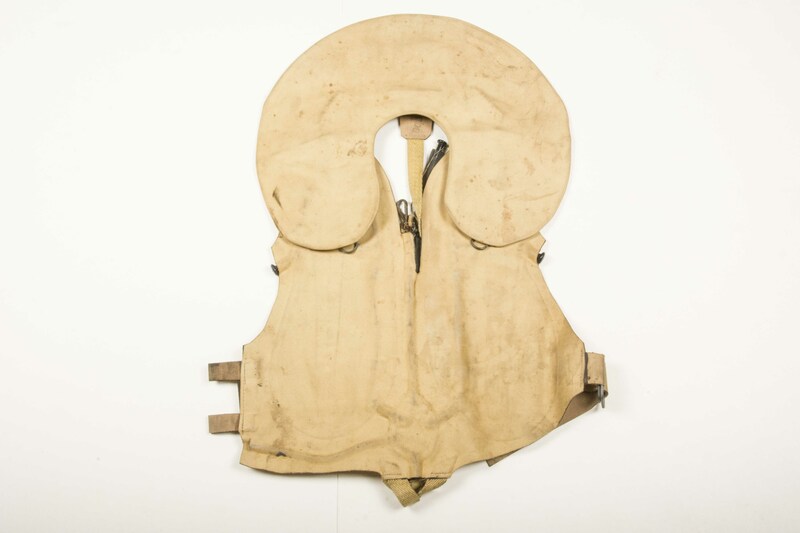 The internals in the pouch have been removed which in this case, in my opinion, was a wartime conversion. 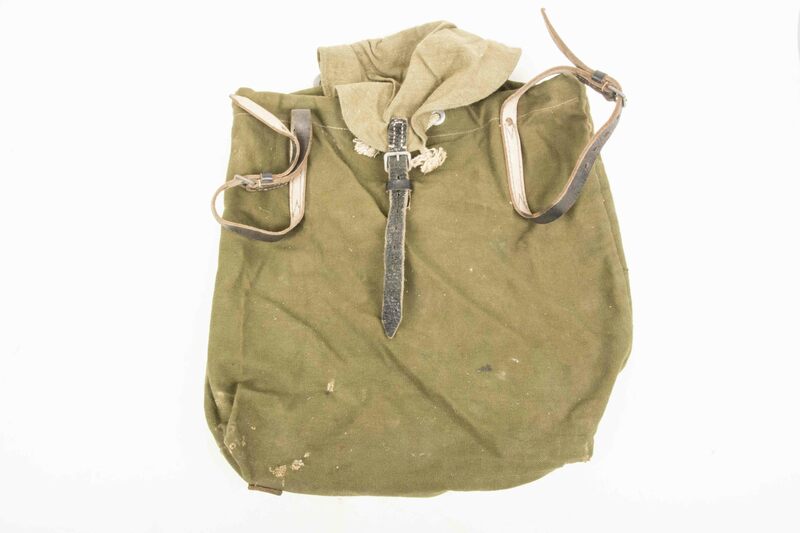 The pouch was used and left behind in Normandy and came out of a old local collection. 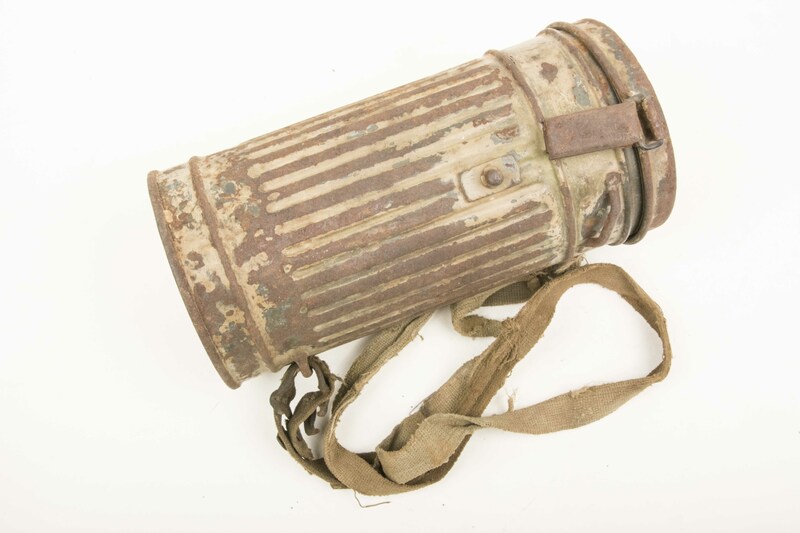 A recent French barnfind, this two tone camouflage gasmask is in very salty condition. The two tone camouflage is applied on top of a blue grey overpaint indicating luftwaffe issue and use. The canister is in untouched, uncleaned condition which would very nicely display next to a helmet in the same camouflage! 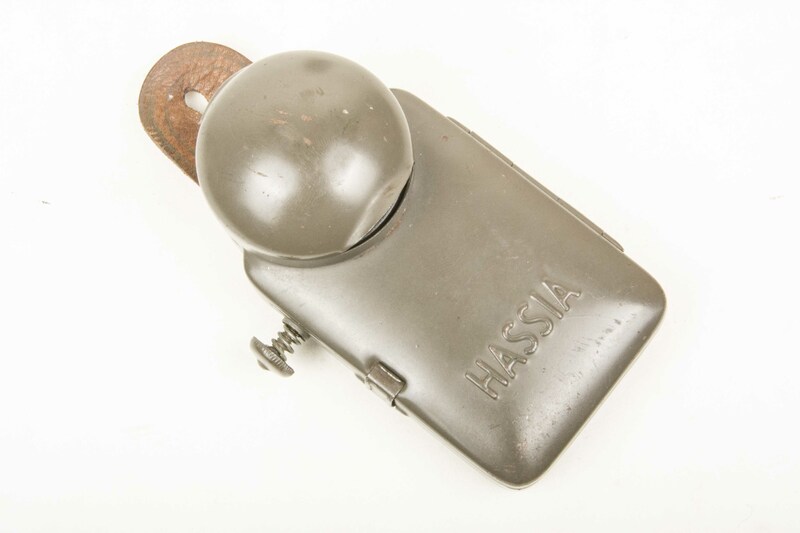 Near mint Hassia flashlight in near mint condition. Very hard to upgrade! A rare variation of pouch marked qkv 44. Unlike the Ros/Fuq marked examples that where found in large numbers in the Ukranian stocks this is a rare beast. The pouch is in light used condition. One of the rarest of original G43 pouches! A nice example of a Bluegrey MP40 magazine pouch. Nicely marked on the back in white ink MP38 u. 40. and dated 1942. The pouch is in very good condition and the brown leather straps are nice and supple. Hard to find example! 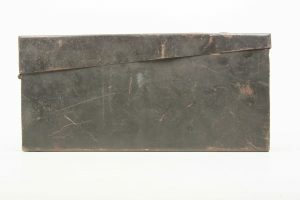 A very scarce original low turret tan sniper scope case marked jvb. Still retaining up to 40% of its original factory tan paint. In a sea of fakes, here is a real one in obvious, combat used condition! 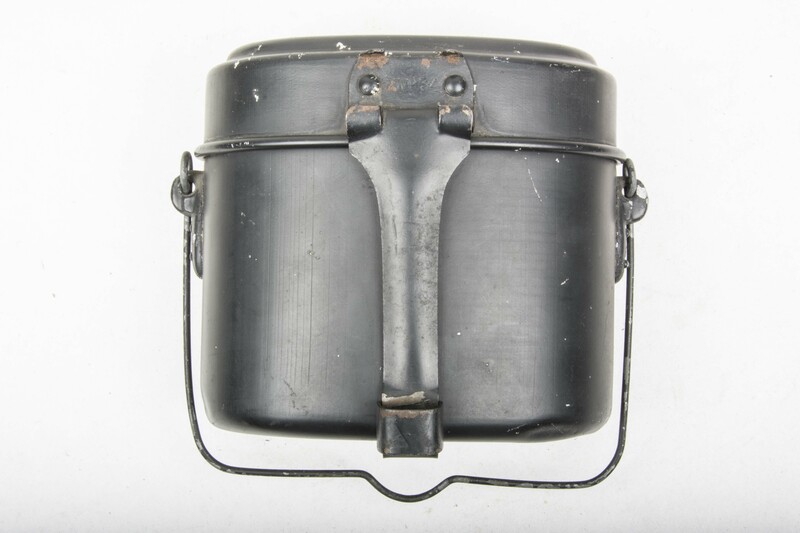 A nice pre war ammunition box for the MG34 machinegun. Still with a lot of original paint remaining. Nice pre war compass with its rare sling, hard to find in this condition! 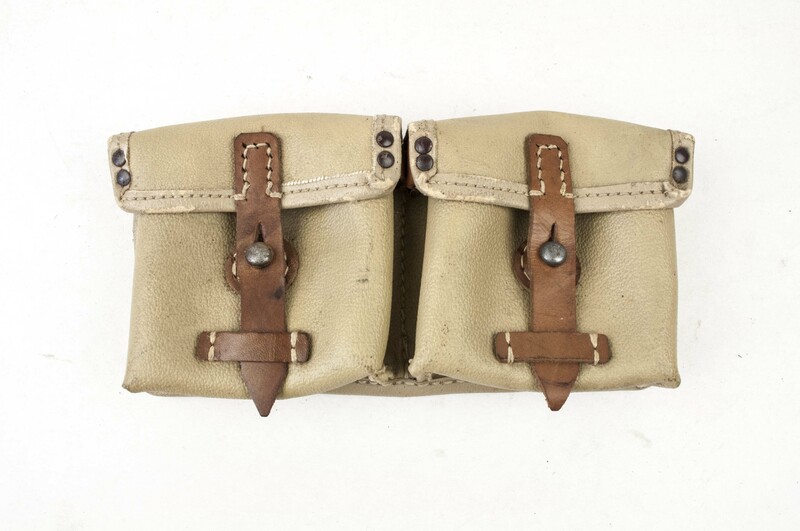 A very nice original A-frame pouch in good used condition. Complete with all straps and ropes. Nicely marked Jean Weipert Offenbach am Main 1940. Carl Feldhaus Aluminium-und Metallwerke, Lüdenscheid. 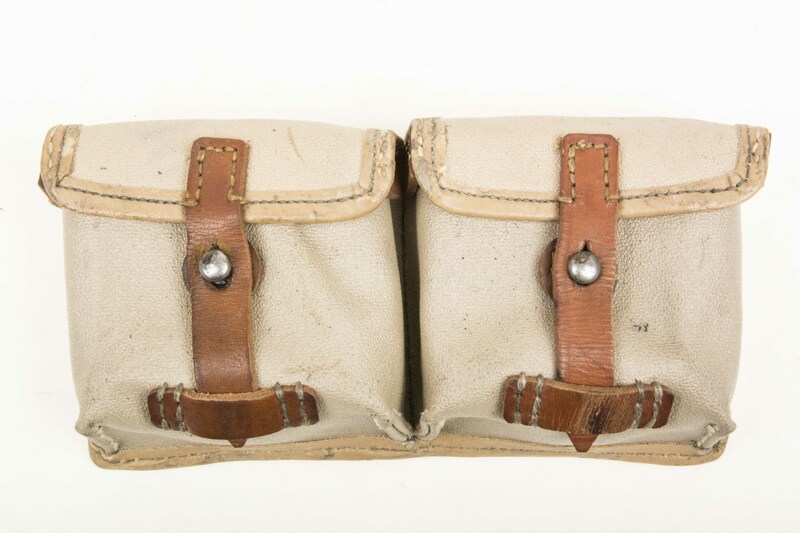 The canteen is in unissued condition with pigskin leather. The long strap is original to the piece and is made out of two different parts of leather. This is not a repair but a late war necessity. 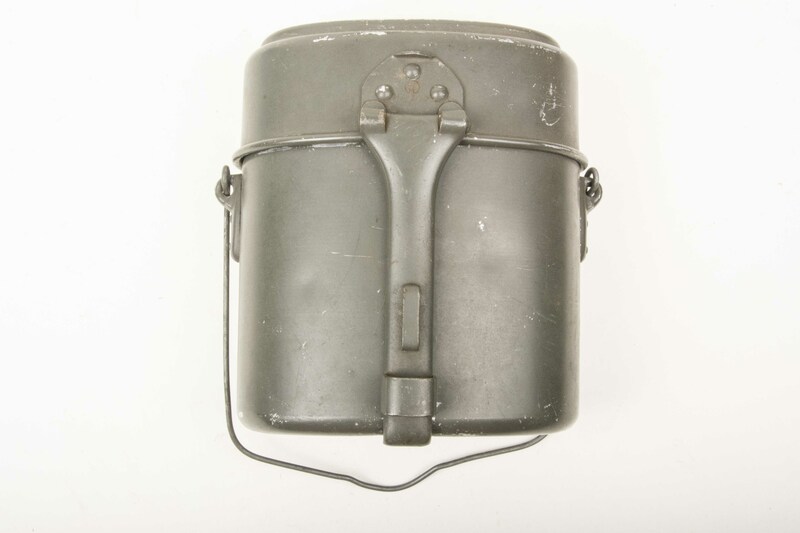 A great midwar medical canteen in great condition! A rare to find pre war compass with its original lanyard. These compasses where issued to NCO’s and CO’s within the Wehrmacht and Waffen-SS. The compass still retains the original lanyard which is pretty hard to find. The mirror on the compass has a small brass portion soldered to open it up, this is a nice wartime modification. 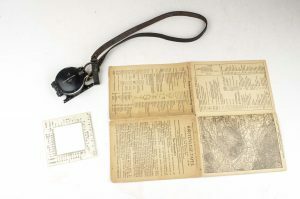 A rare pre war compass with a original map reading manual! 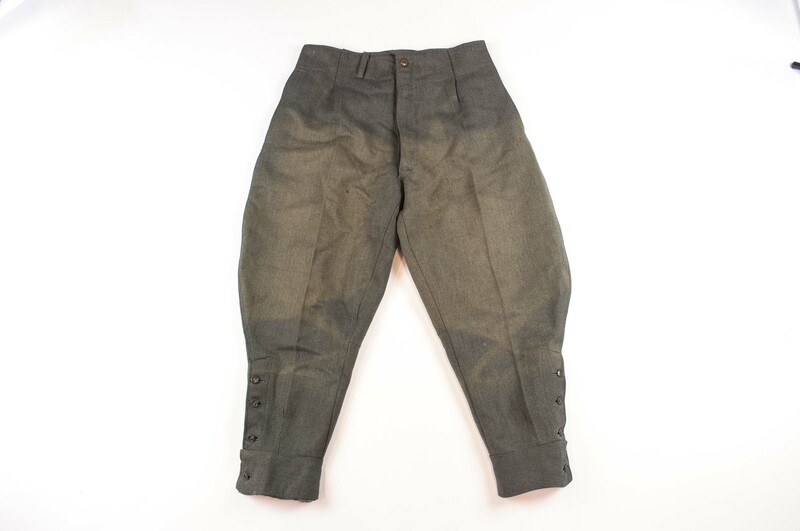 A nice pair of worn Waffen-SS officers breeches. They are in good worn condition. 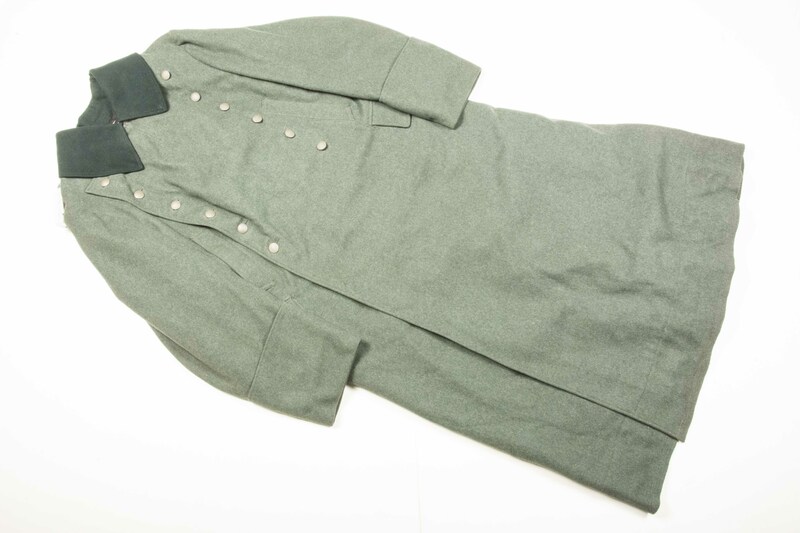 The lining and material is Italian and typical to that of Waffen-SS uniforms. On the front of the trousers sunlight has made some areas of the trousers somewhat lighter. This looks more drastic in the pictures! The pair is in a good mannequin size and would be hard to find another one. A very nice pair of breeches fitting for a Waffen-SS officer! A great original undershirt in mint condition. These shirts are the finishing touch to a mannequin and are becoming very hard to find. The shirt is in unissued condition and has no holes or tears. The size is a nice large fitting most Hindsgaul or John Nissen mannequins. There is a minor stain on the front from the age where it has been folded for a long time. The shirt is otherwise in mint, unissued condition! 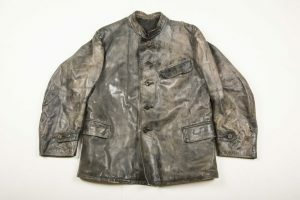 The shirt is of the first field gray model without pockets and dates between 1940 and 1942. 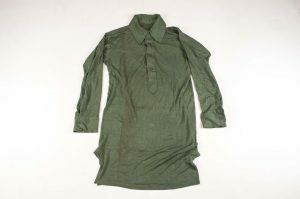 A great original shirt in as new condition which are becoming hard to find! 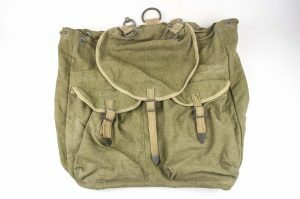 A mid-war tropical rucksack in very good condition. It shows a little age but mostly its just in unissued condition. The rucksack retains all straps, flaps and metal fittings. Hard to upgrade! 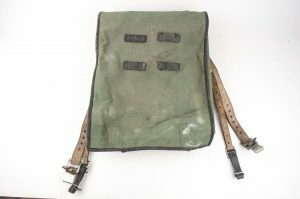 A mid-war tropical rucksack made with British webbing parts by Wirtschaftsamt Litzmannstadt. It shows a little age but mostly its just in lightly used condition. The rucksack retains all straps, flaps and metal fittings. 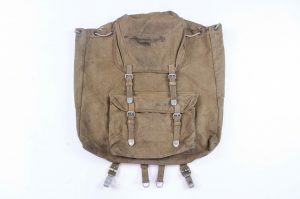 Hard to upgrade with very interesting captured materials recycled into the construction of this rucksack! A very hard to find detail to finish a NCO display. 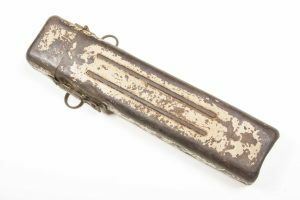 This original German army issue signal whistle made from white horn with its original field gray lanyard is in mint condition. 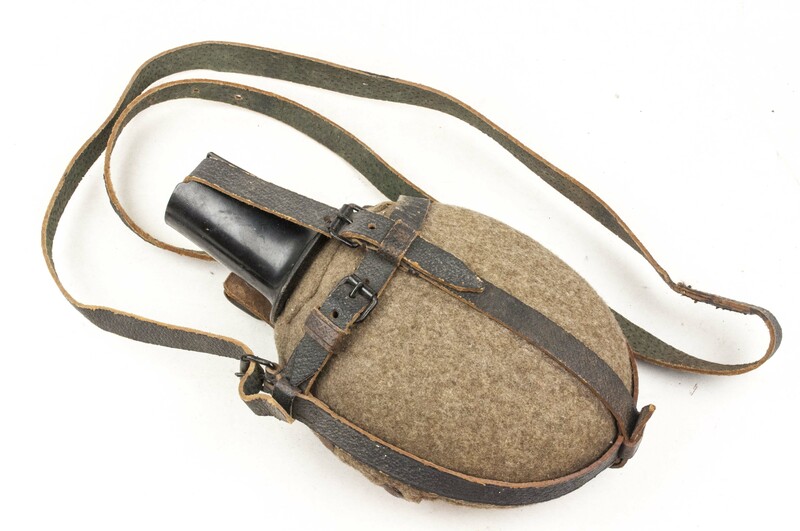 Many commands where given with whistles during combat and the use and recognition of the different signals was something most soldiers would have known. 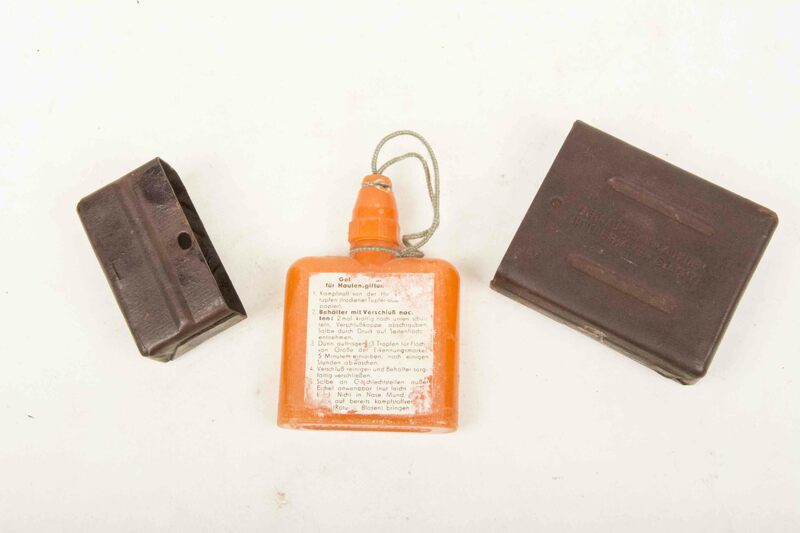 Many private purchase or paramilitary whistles can be found for sale but only very little military issue whistles. To top it off this one comes with the original lanyard and is in mint condition! A nice prewar RZM marked tornister executed in field gray canvas. The Tornister is nicely named to Arpad Molnar. These Tornisters where used by all sorts of political organizations but also by the SS-VT in 1940.